With Parts 1 and 2, we will start with a clear plot screen, with a Plot window of XRange = [ -16, 16 ], YRange = [ -11, 10.9 ], ticks are at 1. This lesson will focus on drawing line segments, parallel, and perpendicular lines. For this part, put the line segment anywhere you wish. 1. Press (Cmds), 3 for Line, 1 for Segment. You are prompted to select on the segment’s end points. Press [ Enter ] to select the end point. 2. Select the other end of segment and press [ Enter ]. The segment is designated as object GC. 3. For the Midpoint, press (Cmds), 2 for Point, 3 for Midpoint. Select the line segment you have just drawn. Remember, when you cursor over objects that you are about to select, that object turns red. Press [ Enter ]. The midpoint is plotted, as object GD. Note that the coordinates the midpoint are not displayed. 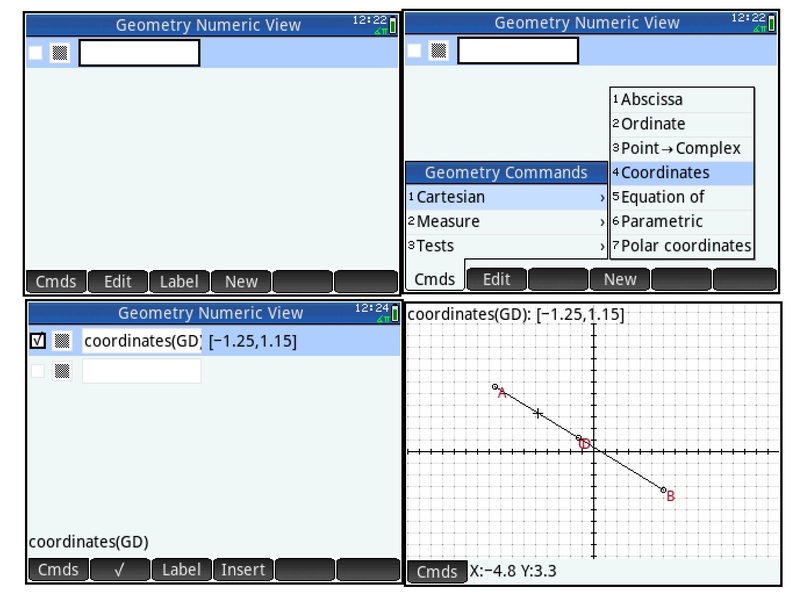 Learn how to display the coordinates in the next segment. There are two ways to display a point’s coordinates. Try both methods and see which method works better for you. 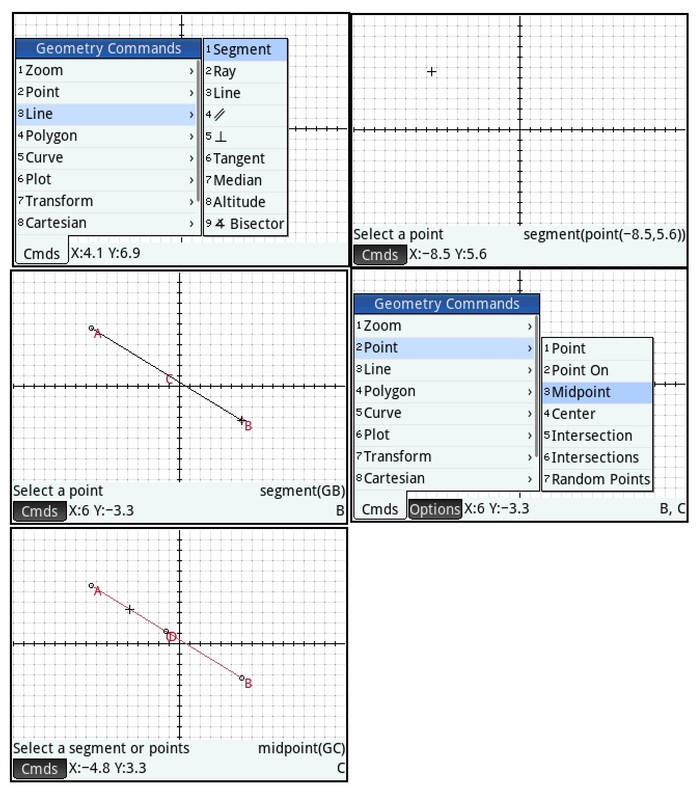 You can use these methods of displaying the coordinates for any point. For this exercise, we’ll concentrate on the midpoint (object GD). 1. Press the [ Num ] key. 2. 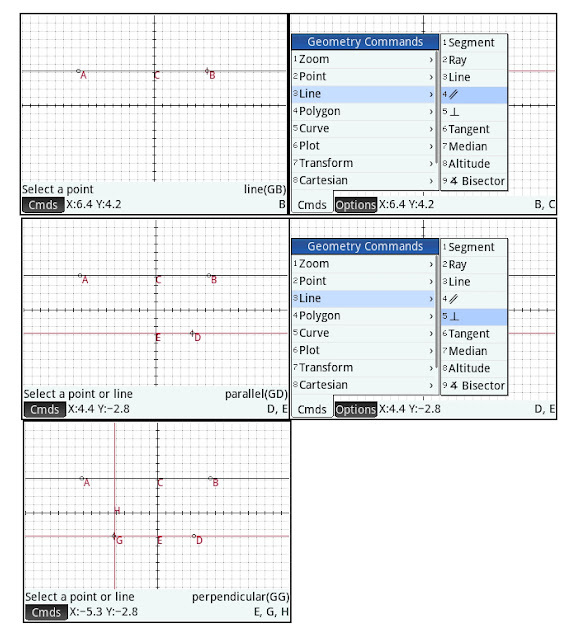 Select a blank line, press (Cmds), 1 for Cartesian, 4 for Coordinates. 3. Type GD and press [ Enter ]. 4. Return the plot screen by pressing [ Plot ]. 1. Press (Cmds), 8 for Cartesian, 4 for Coordinates. 2. Select the point of interest, press [ Enter ]. Either way, the coordinates of the point are displayed on top of the screen. For the next part of the lesson, please clear the plot screen. 2. Parallel Line: Press (Cmds), 3 for Line, 4 for // (Parallel) . Select the line you drew and press [ Enter ]. Place the parallel line with a second [ Enter ]. A parallel line is drawn. 3. Perpendicular Line: Press (Cmds), 3 for Line, 5 for ⊥ (Perpendicular). Select either of the lines and press [ Enter ]. Place the perpendicular lines by pressing [ Enter ]. In Part 4 we will work with drawing tangent lines and how to color objects. This blog entry is coming from me enjoying a pumpkin vanilla latte at The Coffee Bean & Tea Leaf in Monrovia, CA. Hope you day is wonderful and see you next time!